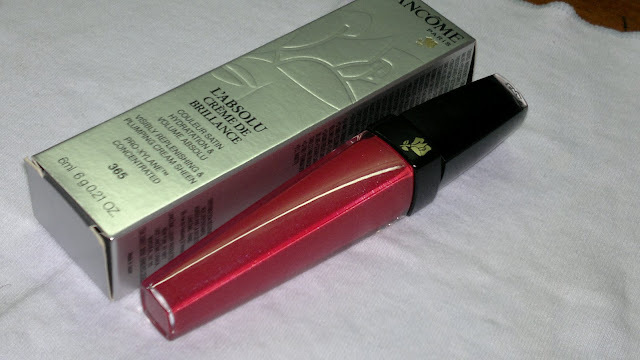 Today I am back with another review from Lancome, which was also a part of the haul (shown HERE). This has since become one of my favorite party gloss. I had been wanting a red lipcolor in my vanity case for long, but was always scared about trying one, 'cause I did't want to look too vampish. So, I decided to opt for a gloss because they are a bit sheerer before going full-on with a red lippie. Price: SGD 30 (approx. INR 1450). Packaging is very cute with the lipgloss contained in a see through plastic tube tapered at both ends. 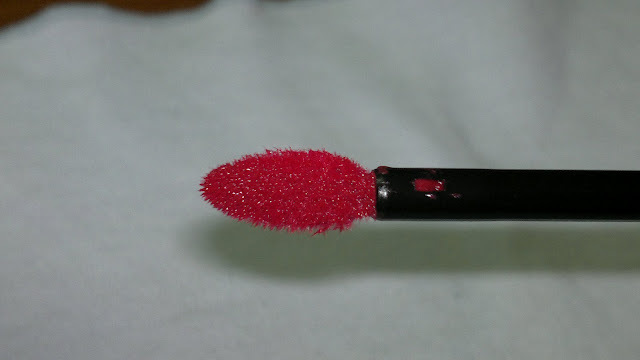 The cap houses the fantastic wand with the applicator. The first thing I liked about this gloss was the color. That was because it came closest to what I was looking for. What I didn't notice at that time was the shimmer, but that is very micro golden shimmer, which doesn't show up much. So basically the lipgloss is between shimmery and matte. Not true shimmer neither true matte. 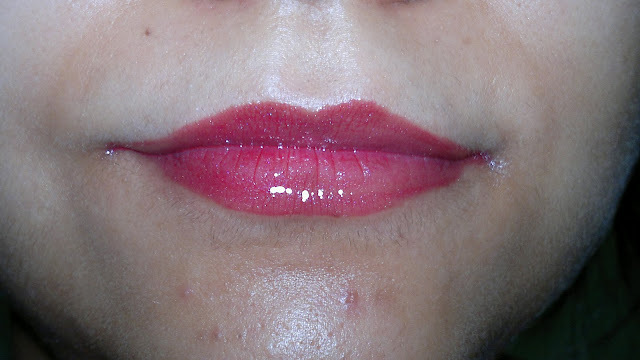 The second thing I love is the texture of the lipgloss, feels so very light on my lips as if I have had nothing on, but highly moisturizing and doesn't take away the hydration even after fading out. My lips feel plumper and the fine lips do appear lesser with this lipgloss. In fact, I feel that it fills them up and gives my lips a healthier and fuller appearance. 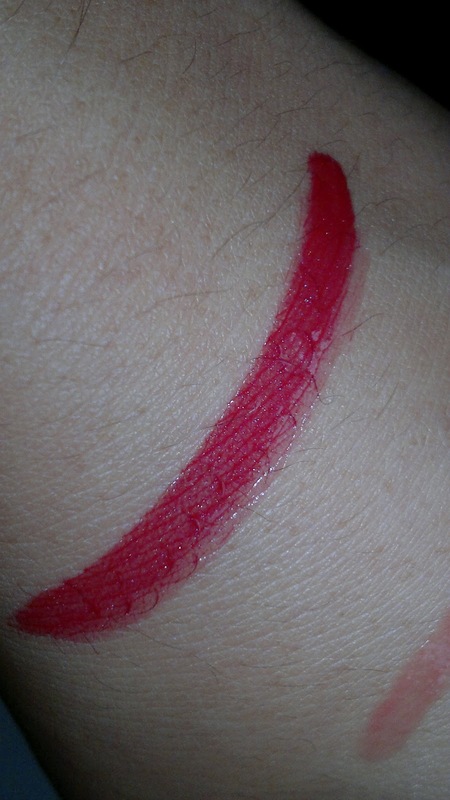 Thirdly, I am in love with the pigmentation. 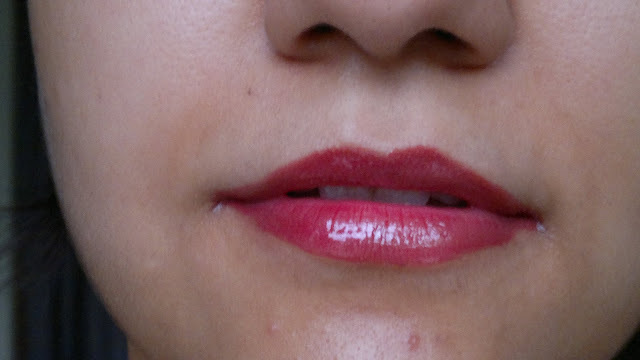 All you see in the swatches above is one coat of the lipgloss, and that is enough to cover my entire lips, without going over again on my lips. 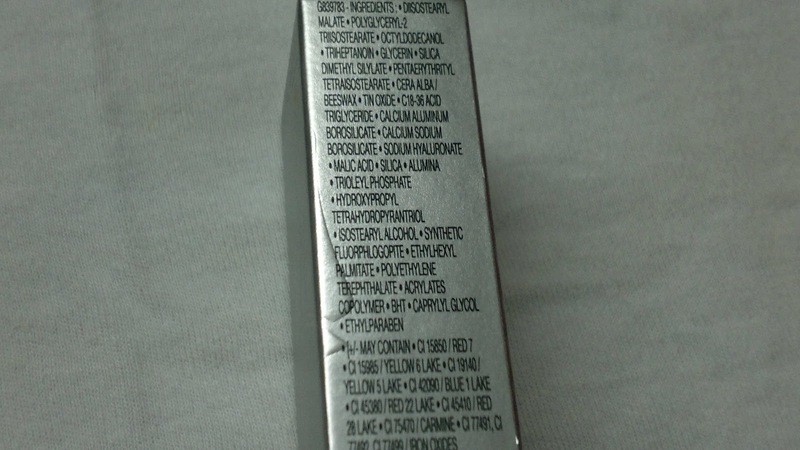 Fourthly the fragrance, as soon as you open the tube you are met with a faintly luxurious fragrance, which might smell different to different people. 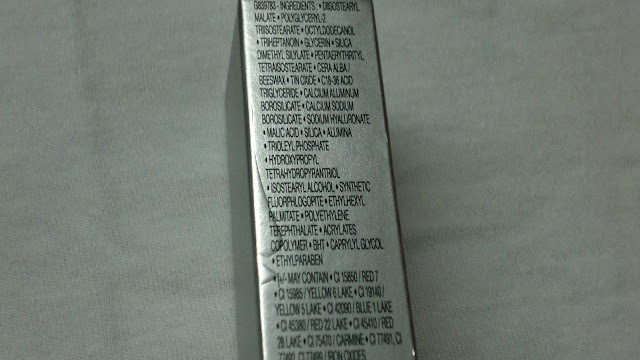 So, check it out to know what the gloss smells to you. To me it smells pretty luxurious. The smell is not disturbing or overpowering, just gives you the feel good factor about wearing the lipgloss. Coming next to the staying power of the gloss, which is like any good lipgloss, 2-3 hours without meals. Meals would make the gloss vanish faster. Though I don't mind as I would love to apply this one again and again. 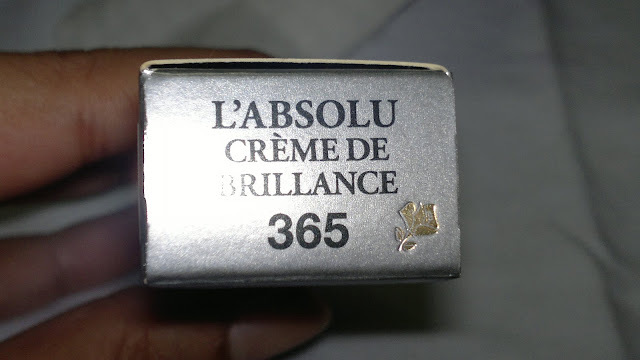 Product rating: A, available at all Lancome stores, though I am not very sure of the color range available here as I purchased it abroad, but surely you would be able to find one in your favorite color. Personally would love to try out more and more awesome products from Lancome, truly worth investing in. that's a very very pretty shade! Lovely colour. 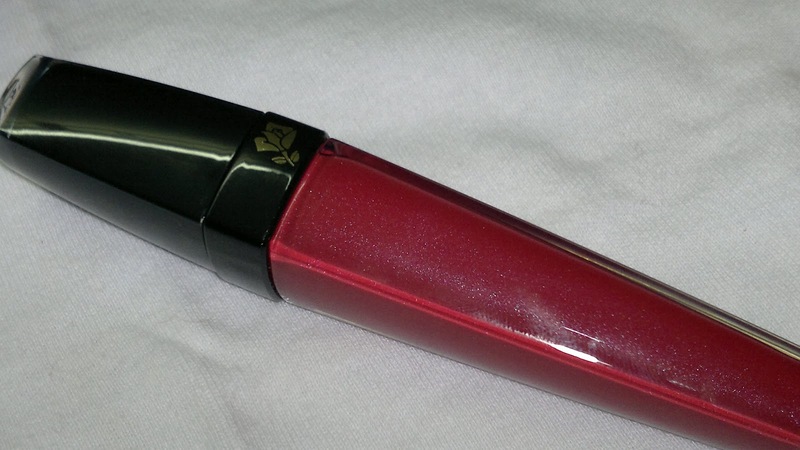 Very similar to Elizabeth Arden gloss in sparkling ruby. Lancome Creme de Brilliance are really nice, much better than their Juicy Tubes which have almost no pigmentation.